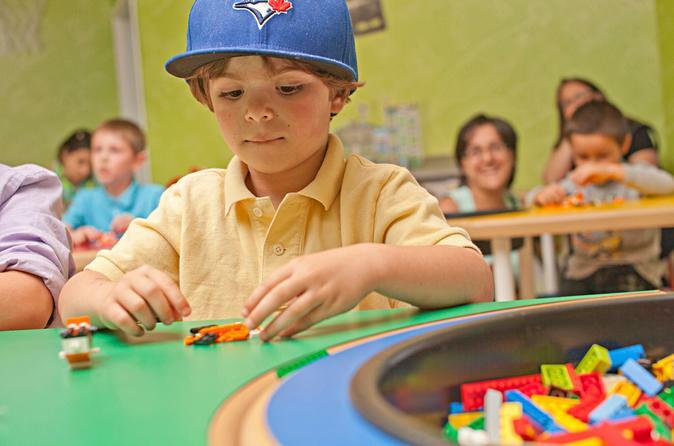 Spend the day at LEGOLAND® Discovery Centre Toronto for 15 action-packed attractions that encourage the whole family to build, play and learn in the LEGO realm. Try engineering a LEGO tower to survive an earthquake; identify models of some of Toronto’s popular landmarks in MINILAND; or learn how LEGO bricks are made in the LEGO Factory. And don’t miss the 4D cinema for a movie like nothing else! Enter LEGOLAND Discovery Centre Toronto for a day of exploration in the creative world of LEGO® bricks. Your admission takes you on rides, interactive exhibits and a 4D theater. Your first stop might be in MINILAND, where more than one million LEGO bricks were used to construct Toronto area landmarks. Make a game of identifying as many of the buildings as you can. When you need a thrill, take the adventurous kids in your group on rides such as Kingdom Quest Laser Ride and Merlin’s Apprentice. The smaller members of the group (ages 1–5) can build forts at the DUPLO Village, stacking soft play bricks into anything from big structures to small forts. After you've seen what it takes to build a village, watch some more action over at a jungle gym where kids run around pretending to be firefighters. And everyone is welcome to try a hand at building a LEGO tower at the Earthquake Tables exhibit in hopes it will withstand the tremors reverberating from the tables. For more hands-on fun, head to the LEGO Master Builder Academy, led by one of the master model builders, to learn how to turn piles of the colorful bricks into masterpieces. Alternatively, at Olivia's house you can perform on the LEGO Friends karaoke stage. When you’re ready to rest your feet after all the action, head to the 4D Cinema theater and see the LEGO Legends of Chima movie where the characters try to win the land of CHI. You’ll be convinced that you’re part of the movie during this 4D cinema experience. For a bite to eat, the cafe offers light meals and snacks (own expense). If you’re in search of the latest LEGO creations, you can browse through a range of toys at the shop. Special Offer - Price displayed includes a 15% discount off the local admission price! - Book Now!